Purpose Laparoscopic transperitoneal endoscopic (TAPP) and totally extraperitoneal (TEP) hernia repair have been well established in primary and recurrent inguinal hernias . Only few studies [2, 3, 4, 5] evaluate the surgical outcome of patients with inguinal hernias after radical prostatectomy, using the TAPP or TEP procedure. But controversies remain including its feasibility, safety and recurrence rate. The mesh size to be used and the necessity of a complete dissection of the scared retropubic space are discussed controversially. Long-term follow-up studies are missing. Methods After introducing the technique of a laparoscopic transperitoneal endoscopic hernioplasty (TAPP) at the hospital in October 1992, this approach had been recommended to all adult patients with inguinal and femoral hernias. In our single-center study, the medical records of all 5,764 patients with 7,010 inguinal and femoral hernias, operated from 1993 until 2009, were enrolled in a retrospective analysis. A TAPP procedure was performed in 6,582 hernias (Peitsch, Surg Endosc 28:671–682, 2014). During that period, 48 patients with 55 inguinal hernias on average of 3.7 years (3 months–14 years) after prior open radical retropubic prostatectomy underwent hernia surgery (92.7% TAPP). The age of these patients, time required for surgery, hernia location (medial, lateral, combined and bilateral), the perioperative (30-day complications “Clavien Classification”) and late complications with a median postoperative follow-up time of 8.0 years (2–17 years) were analyzed and compared with the data of the control group (all TAPP procedures for inguinal and femoral hernias). Results Patients with inguinal hernias after radical open retropubic prostatectomy were older as patients of the control group (70.3 vs. 59.1 years) and the medial time required for surgery was significantly longer (72.9 vs. 41.3 min). 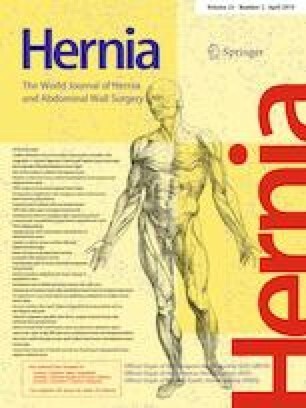 Less frequent were bilateral inguinal hernias (25.5 vs. 35.8%), medial inguinal hernias (Hernia classification Nyhus Type 3A) with 5.5 vs. 17.9% and femoral hernias (0 vs. 4.9%). No hernia patient after radical prostatectomy and only 0.1% of the control group (n = 6582 hernias) had a conversion to an anterior open repair. One patient after radical prostatectomy needed a laparoscopic drainage of a hemato-seroma 48 h postoperatively (1/51). The rate of late postoperative complications was low. 4.8% of patients reported of groin pain and 2.4% of testicular pain longer than 28 days postoperatively. The hernia recurrence rate of 2.4% (1/42 TAPP) was not significantly different from the control group (1.8%, 16/896 hernias). Conclusions In the hands of surgeons with large experiences in endoscopic laparoscopic hernia repair, the laparoscopic transperitoneal hernioplasty (TAPP) after previous radical open retropubic prostatectomy is safe and effective with low intra- and postoperative complications and low hernia recurrences (2.4%). A TAPP technique with closure of hernia gaps larger than 1 × 1 cm with non-absorbable surgical sutures and a mesh-size of 13 × 13–15 cm is requested. A complete sharp dissection of the retropubic scared tissue for mesh implantation is not mandatory. WKJP project development, data collection and manuscript writing. WKJP declares no conflict of interest. The manuscript has not been submitted to more than one journal of simultaneous consideration. This manuscript has not been published previously. Only the recurrence rate of a group of hernias with TAPP procedure, operated in 1994, 1999, 2004 and 2009, has been published before . This study was not funded. WKJP has has not received research and educational grants or consulting fees. Ethical approval was agreed by the ethical committee of the Faculty of Medicine at the University of Göttingen, Germany. Informed consent was obtained from all individual patients including in the study.